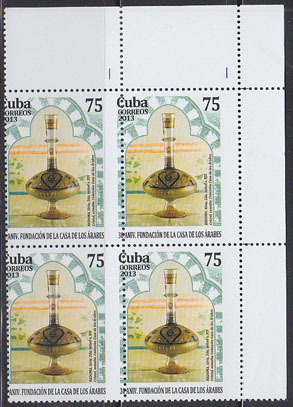 16334 VAR CUBA (2009) Dominos. Block of 4 missing colors black and red. Scott No 5029. 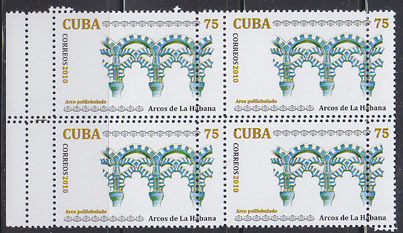 15212 VAR CUBA (2010) Polylobular arches - Havana. Block of 4 misperforated. Scott No 5154. 15237 VAR CUBA (2012) Eiffel tower. Block of 4 missing most colors. 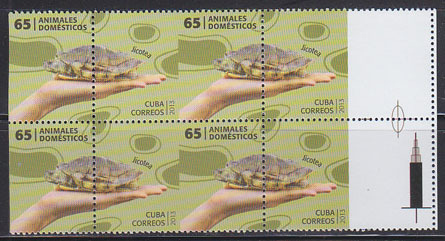 15146 VAR CUBA (2013) Hand holding turtle. Misperforated block of 4. Scott No 5376. 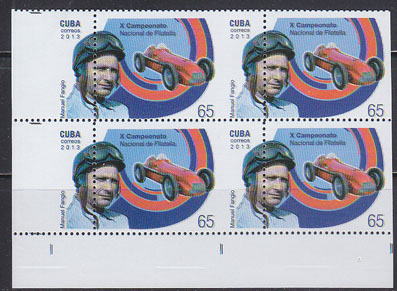 15470 VAR CUBA (2013) Juan Fangio. Misperforated block of 4. Scott No 5450. Formula I racer. 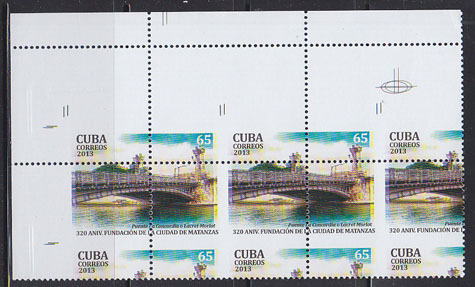 15789 VAR CUBA (2013) LaConcordia bridge - Matanzas. Misperforated block of 4. Scott No 5437. 16339 VAR CUBA (2013) Ancient Syrian glass bottle. Misperforated block of 4. Scott No 5456. 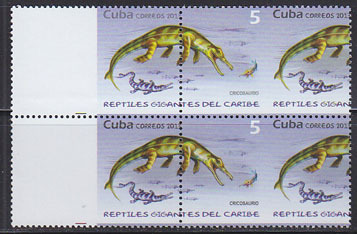 16912 VAR CUBA (2013) Cricosaurus. Misperforated block of 4. Scott No 5384. 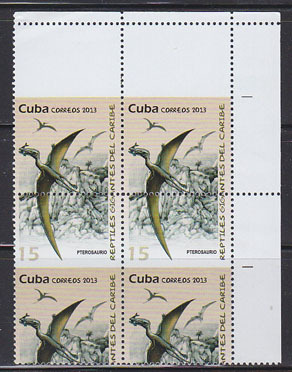 16913 VAR CUBA (2013) Pterosaurus. Misperforated block of 4. Scott No 5385. 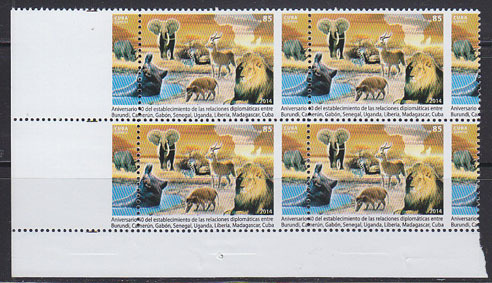 15080 VAR CUBA (2014) African wildlife. Misperforated block of 4. Scott No 5539. Relations with African countries. 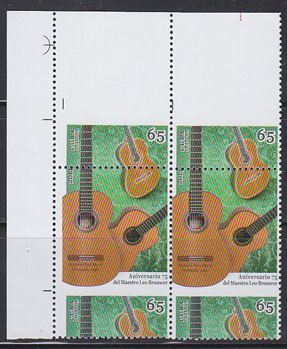 16763 VAR CUBA (2014) Guitars. Misperforated block of 4. Scott No 5542. Leo Brouwer anniversary. 9712 VAR CUBA (2016) Sacred ibis (Threskiornis aethiopicus)*. Error with color shifts revealing a double image. 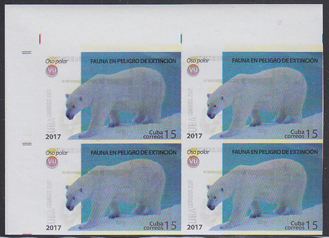 9088 VAR CUBA (2017) Polar bear. 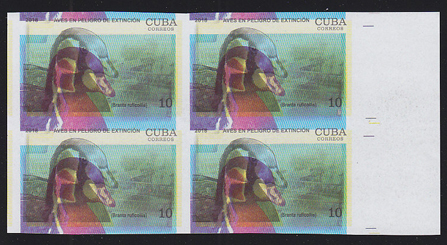 Imperforate block of 4 with light impression of another stamp overlaying image (might be Unversidad de la Revolucion). Endangered species series. 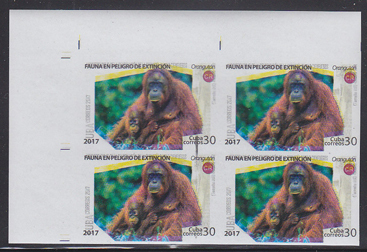 9089 VAR CUBA (2017) Orangutan. 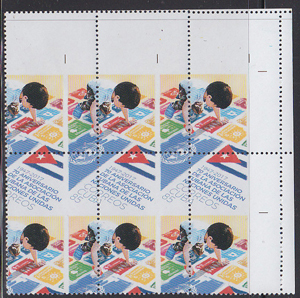 Imperforate block of 4 with light impression of another stamp overlaying image (might be Unversidad de la Revolucion). Endangered species series. 9090 VAR CUBA (2017) Kangaroo. Imperforate block of 4 color with major shift resulting in double image. Endangered species series. 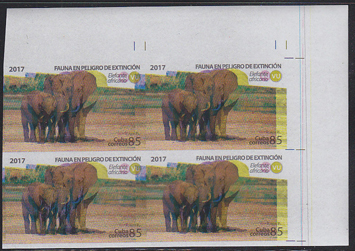 9149 VAR CUBA (2017) African elephant. Imperforate block of 4 color shift of yellow and cyan. Endangered species series. 9713 VAR CUBA (2017) Golden parakeet or golden conure (Guaruba guarouba). 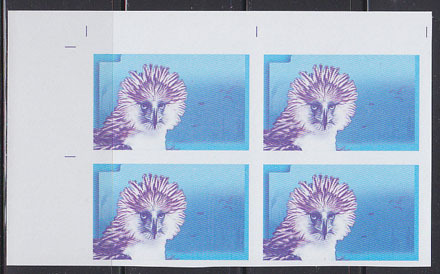 Imperforate block of 4 missing color yellow and another bird superimposed. Multiple errors!]. 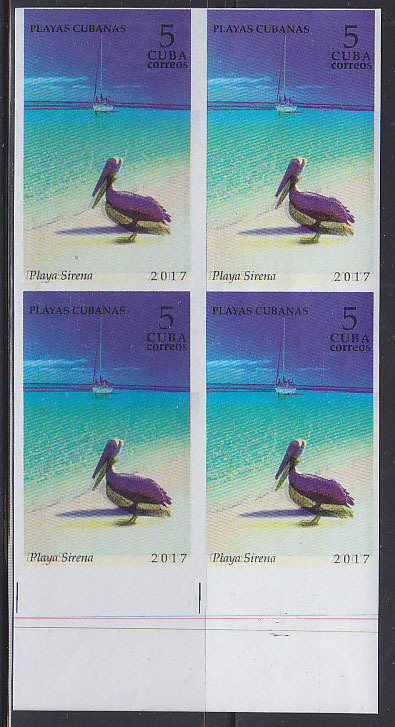 9715 VAR CUBA (2017) Pelican. Sailboat. 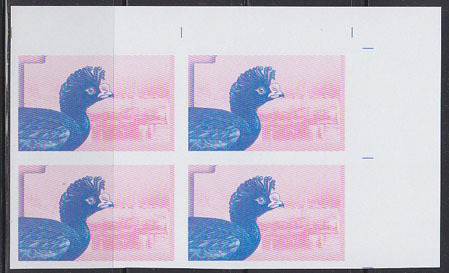 Imperforate block of 4 with color shift of color black. 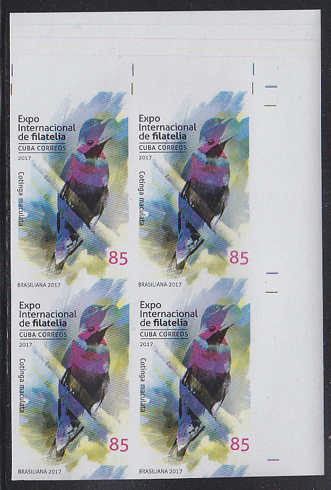 9722 VAR CUBA (2017) Red-cowled Cardinal (Paroaria dominicana). Imperforate block of 4 with color shift and double print of black inscriptions. 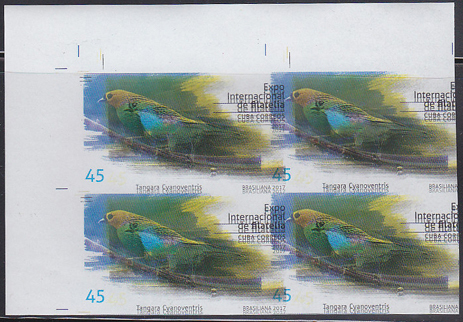 9723 VAR CUBA (2017) Gilt-edged Tanager (Tangara cyanoventris). Imperforate block of 4 with color shift and doubling of the black inscriptions. 9724 VAR CUBA (2017) Saw-billed hermit hummingbird(Ramphodon naevius). Imperforate block of 4 missing yellow and black color. 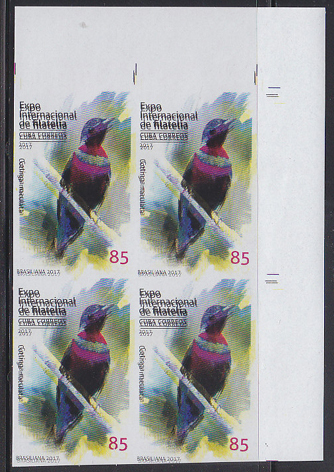 9725 VAR CUBA (2017) Banded cotinga (Cotinga maculata). 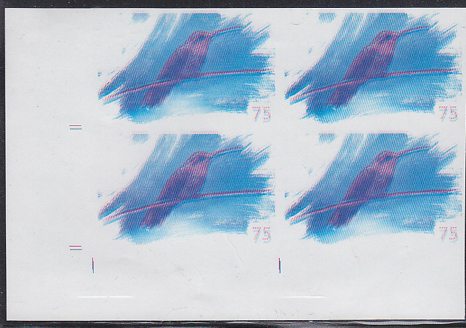 Imperforate block of 4 with color shift resulting in double image. 9726 VAR CUBA (2017) Banded cotinga (Cotinga maculata). Imperforate block of 4 with doubling of black inscriptions. 9727 VAR CUBA (2017) Saw-billed hermit hummingbird(Ramphodon naevius). Imperforate block of 4 with only yellow and black color. 9728 VAR CUBA (2017) Banded cotinga (Cotinga maculata). Imperforate block of 4 missing colors yellow and black. 9729 VAR CUBA (2017) Araripe manakin (Antilophia bokermanni). Imperforate block of 4 missing colors yellow and black. 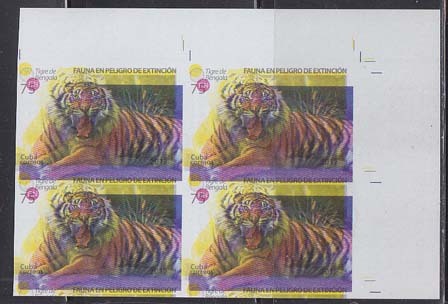 9834 VAR CUBA (2017) Bengal tiger. Imperforate block of 4 color shift of yellow and cyan. Endangered species series. 10281 VAR CUBA (2017) Clamshell orchid (Prosthechea cochleata. 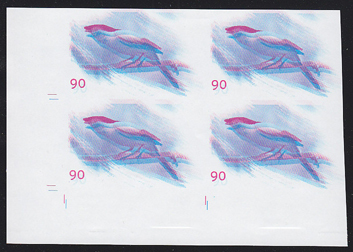 Imperforate block of 4 with massive color shift. 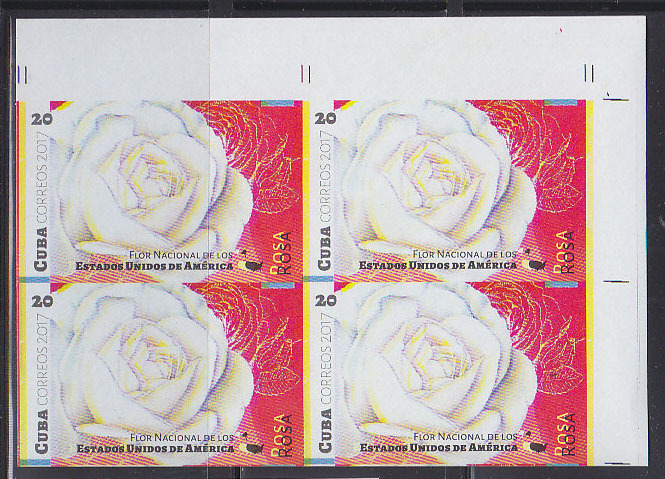 10292 VAR CUBA (2017) White rose. 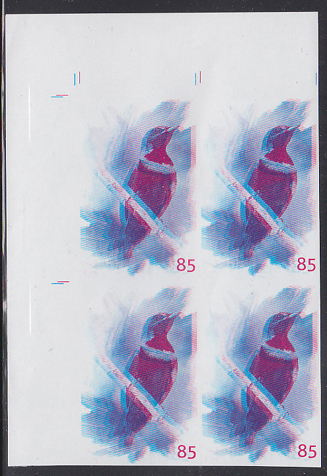 Imperforate block of 4 with color shift of black. 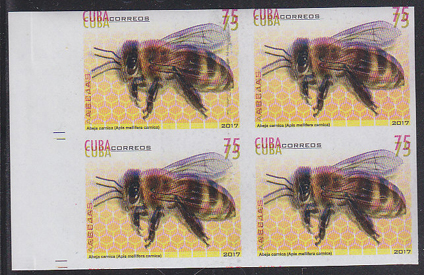 10463 VAR CUBA (2017) African honey bee (Apis mellifera scutellata). Imperforate block of 4 with massive color shift. 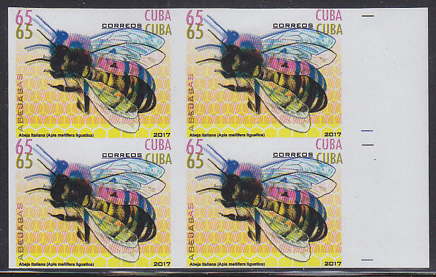 10464 VAR CUBA (2017) Asiatic honey bee (Apis cerana). Imperforate block of 4 with color shift resulting in double image. 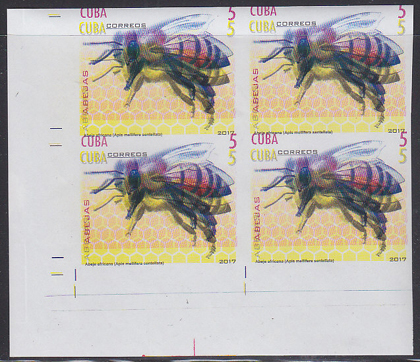 10465 VAR CUBA (2017) Italian honey bee (Apis mellifera ligustica). 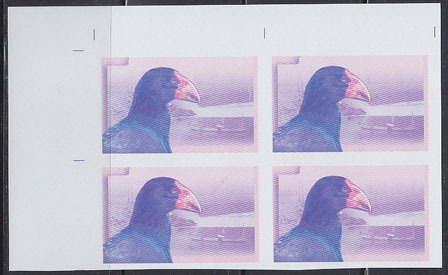 Imperforate block of 4 with massive color shift. 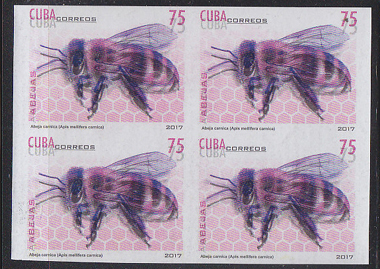 10466 VAR CUBA (2017) Carniolan honey bee (Apis mellifera carnica). Imperforate block of 4 with color shift resulting in double image. 10467 VAR CUBA (2017) Carniolan honey bee (Apis mellifera carnica). 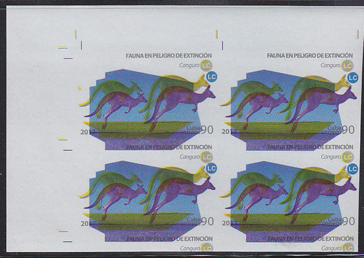 Imperforate block of 4 with color shift and yellow missing. 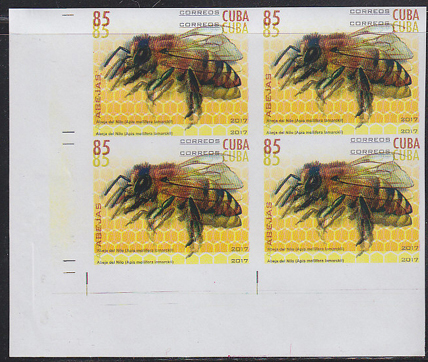 10468 VAR CUBA (2017) Egyptian honey bee (Apis mellifera lamarckii). 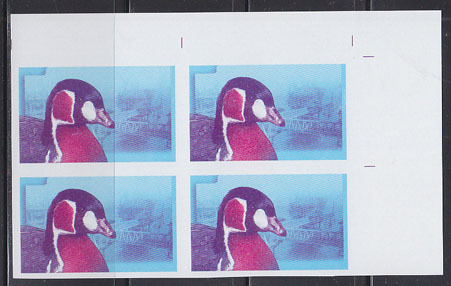 Imperforate block of 4 with massive color shift. 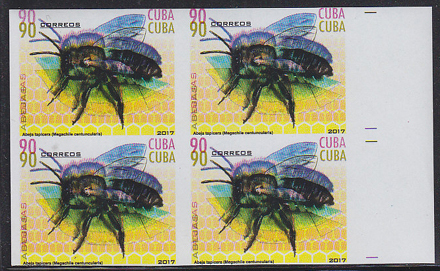 10469 VAR CUBA (2017) Patchwork Leaf-cutter (Megachile centuncularis). 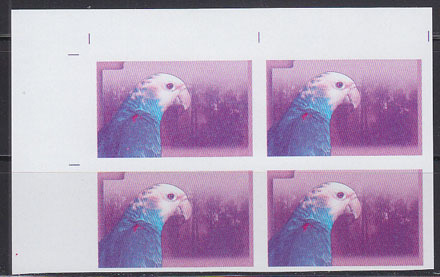 Imperforate block of 4 with massive color shift. 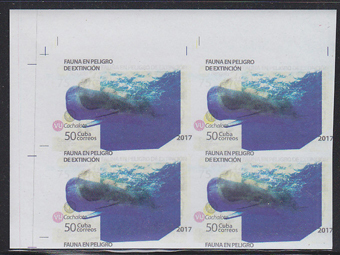 10571 VAR CUBA (2017) Sperm whale. Imperforate block of 4 color shift of yellow and cyan. Endangered species series. 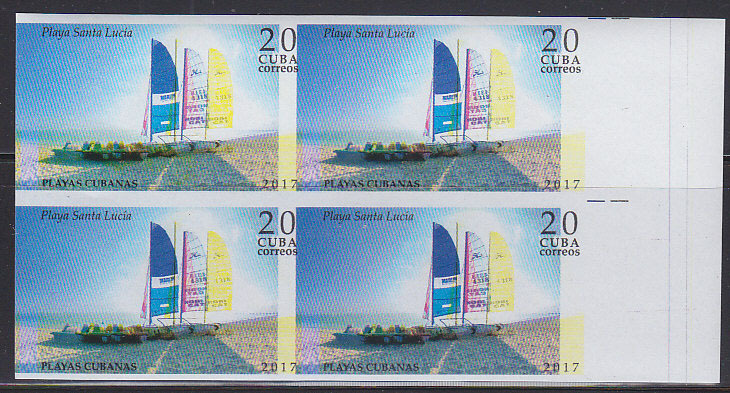 11249 VAR CUBA (2017) Catamarans. 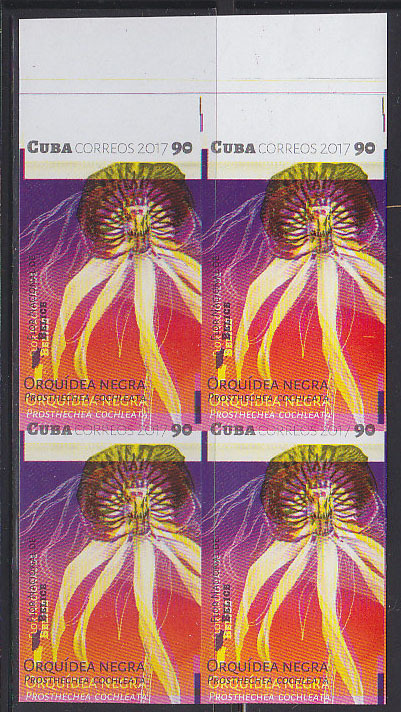 Imperforate block of 4 with massive color shift. 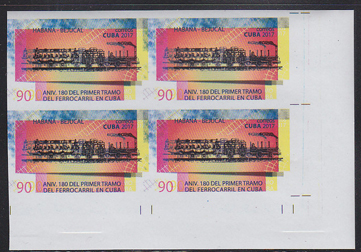 11680 VAR CUBA (2017) First Cuban train 180th anniversary. Imperforate block of 4 with color shift resulting in double image. 11777 VAR CUBA (2017) 70 years of Cuban membership in UN. Misperforated block of 4. 15731 VAR CUBA (2017) Great curassow (Crax rubra). Imperforate block of 4 missing colors yellow and black. 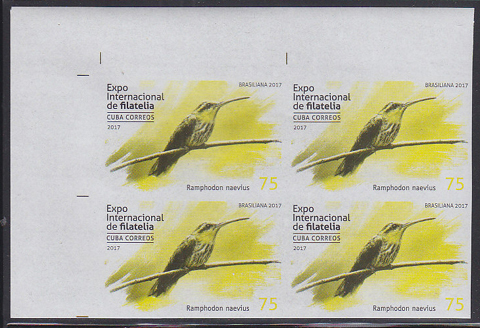 15732 VAR CUBA (2017) Kagu (Rhynochetos jubatus) + 2 other birds. Imperforate block of 9 printed on top of print of souvenir sheet for this issue. A truly spectacular error! 15733 VAR CUBA (2017) Great currasow (Crax rubra) + 2 otherbirds. 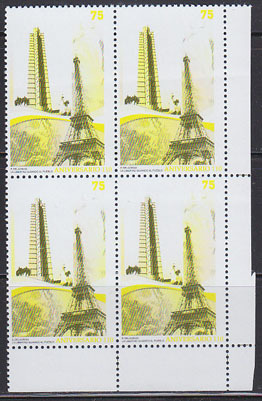 Imperforate block of 9 printed on top of print of souvenir sheet for this issue. A truly spectacular error! 15735 VAR CUBA (2017) Western swamphen (Porphyrio martello). Imperforate block of 4 missing colors yellow and black. 15758 VAR CUBA (2017) Chaco eagle (Harpyhaliaetus coronatus). Imperforate block of 4 missing colors yellow and black. 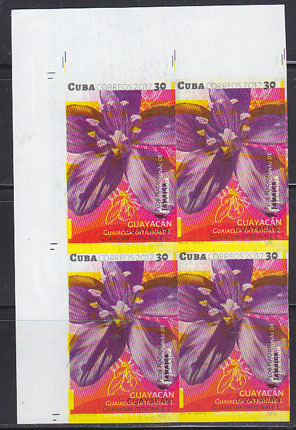 16249 VAR CUBA (2017) Guaiacwood (Guaiacum officinale). 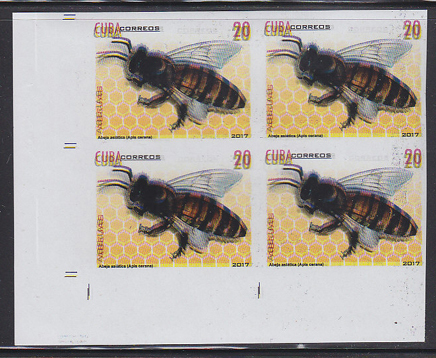 Imperforate block of 4 with color yellow shifted. 15736 VAR CUBA (2018) Red-breasted goose (Branta ruficollis). Imperforate block of 4 with colors yellow and black missing. 15737 VAR CUBA (2018) Red-breasted goose (Branta ruficollis). 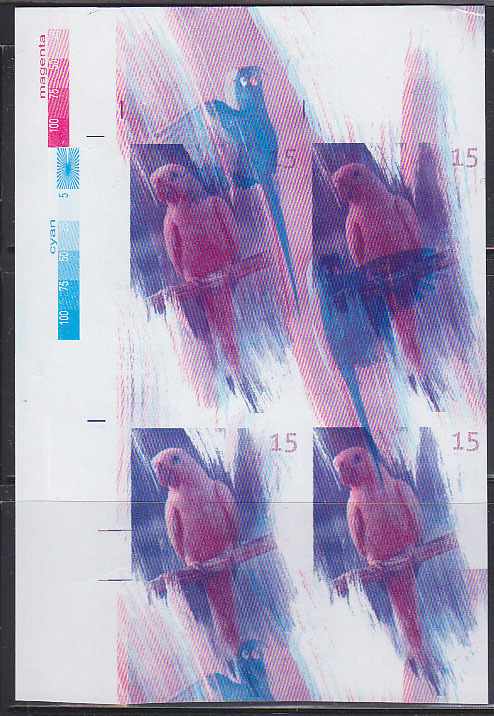 Imperforate block of 4 with colors shifted, resulting in double image. 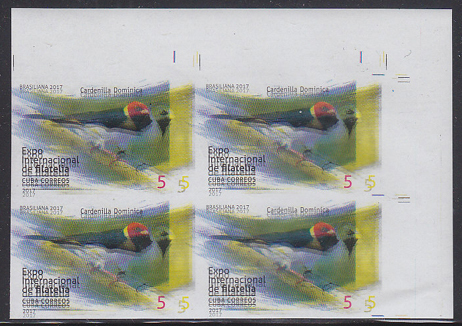 15741 VAR CUBA (2018) Yellow-headed amazon (Amazona oratrix). 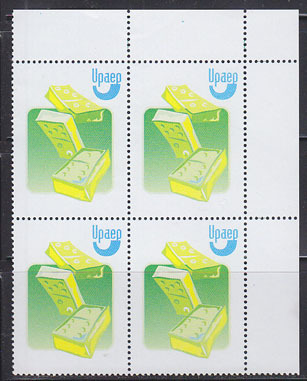 Imperforate block of 4 with colors yellow and black missing.